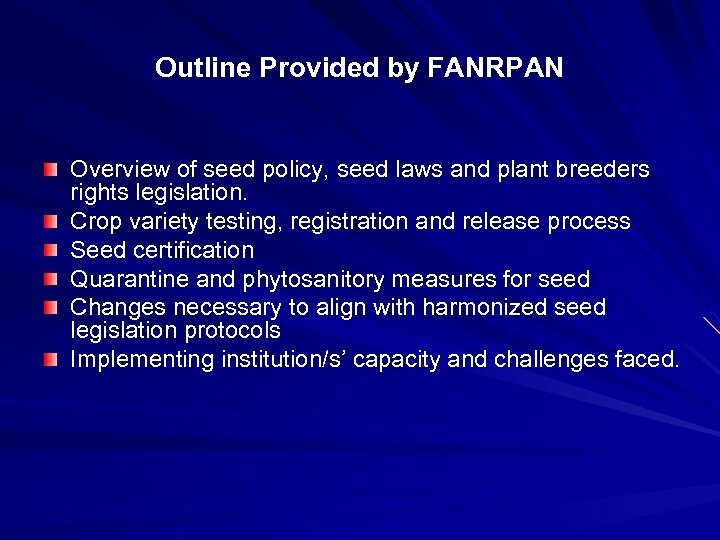 Outline Provided by FANRPAN Overview of seed policy, seed laws and plant breeders rights legislation. Crop variety testing, registration and release process Seed certification Quarantine and phytosanitory measures for seed Changes necessary to align with harmonized seed legislation protocols Implementing institution/s’ capacity and challenges faced. 1. 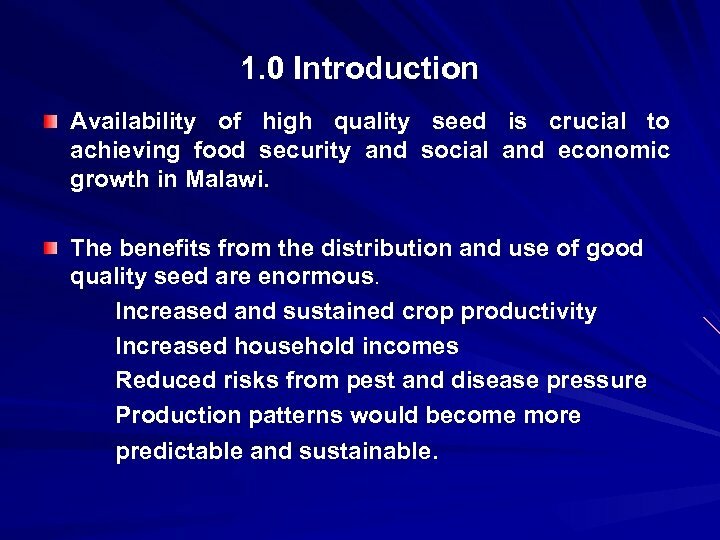 0 Introduction Availability of high quality seed is crucial to achieving food security and social and economic growth in Malawi. The benefits from the distribution and use of good quality seed are enormous. Increased and sustained crop productivity Increased household incomes Reduced risks from pest and disease pressure Production patterns would become more predictable and sustainable. 1. 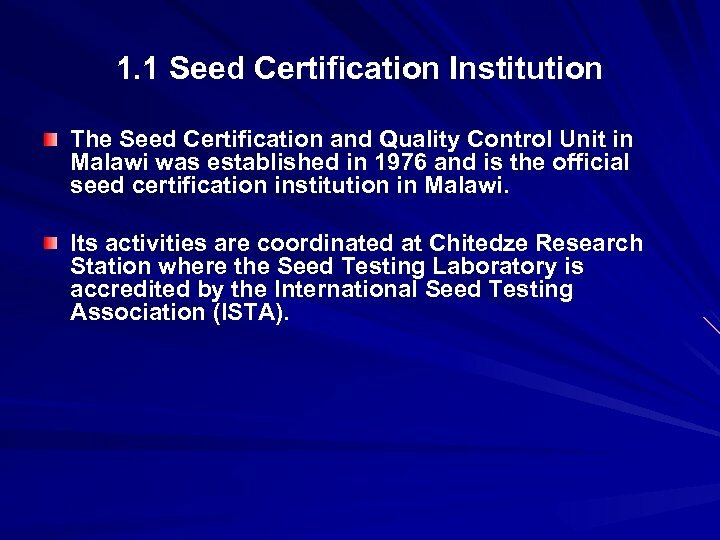 1 Seed Certification Institution The Seed Certification and Quality Control Unit in Malawi was established in 1976 and is the official seed certification institution in Malawi. Its activities are coordinated at Chitedze Research Station where the Seed Testing Laboratory is accredited by the International Seed Testing Association (ISTA). 1. 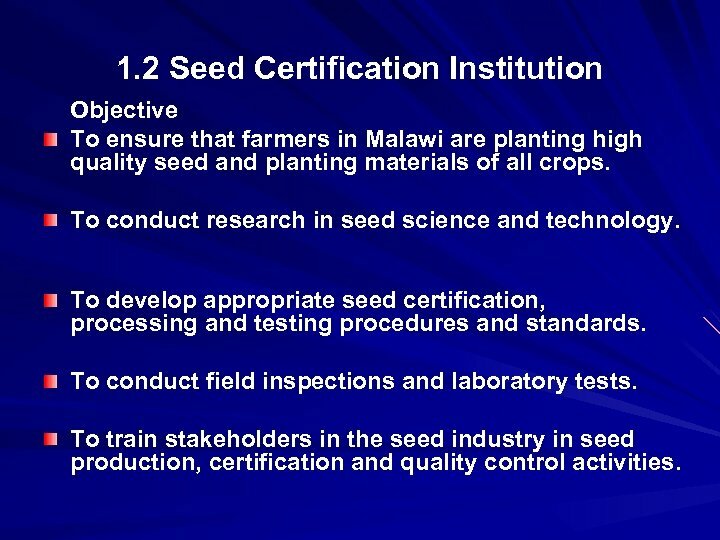 2 Seed Certification Institution Objective To ensure that farmers in Malawi are planting high quality seed and planting materials of all crops. To conduct research in seed science and technology. To develop appropriate seed certification, processing and testing procedures and standards. To conduct field inspections and laboratory tests. To train stakeholders in the seed industry in seed production, certification and quality control activities. 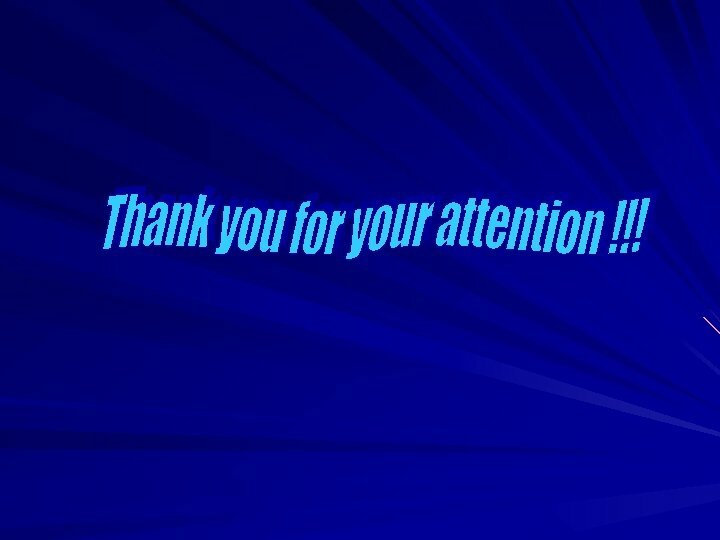 • 2. 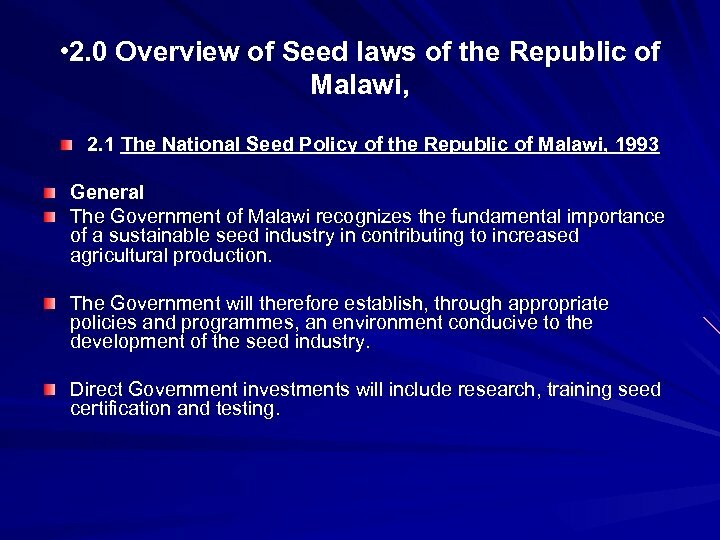 0 Overview of Seed laws of the Republic of Malawi, 2. 1 The National Seed Policy of the Republic of Malawi, 1993 General The Government of Malawi recognizes the fundamental importance of a sustainable seed industry in contributing to increased agricultural production. The Government will therefore establish, through appropriate policies and programmes, an environment conducive to the development of the seed industry. Direct Government investments will include research, training seed certification and testing. 2. 1. 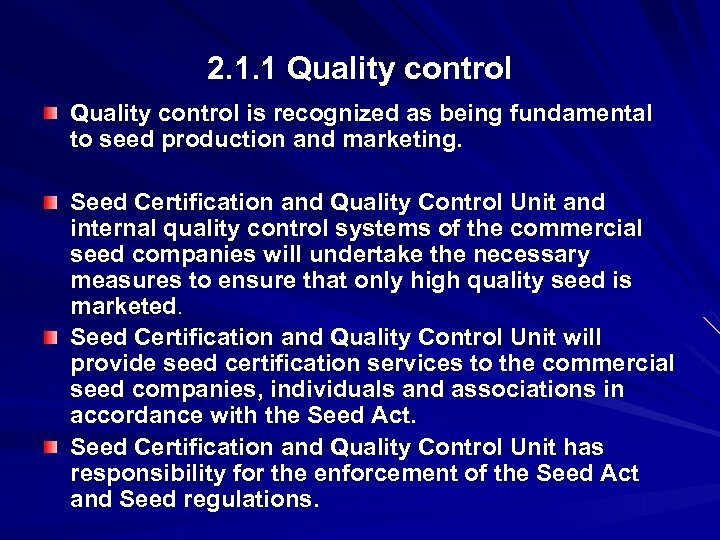 1 Quality control is recognized as being fundamental to seed production and marketing. Seed Certification and Quality Control Unit and internal quality control systems of the commercial seed companies will undertake the necessary measures to ensure that only high quality seed is marketed. Seed Certification and Quality Control Unit will provide seed certification services to the commercial seed companies, individuals and associations in accordance with the Seed Act. 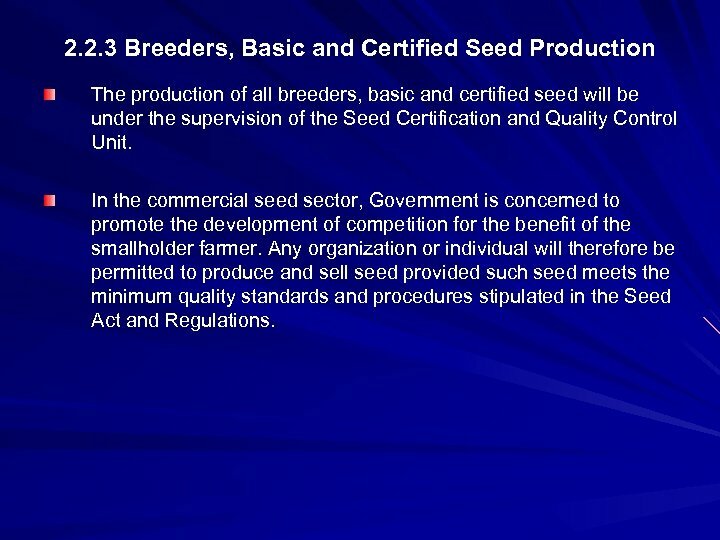 Seed Certification and Quality Control Unit has responsibility for the enforcement of the Seed Act and Seed regulations. 2. 1. 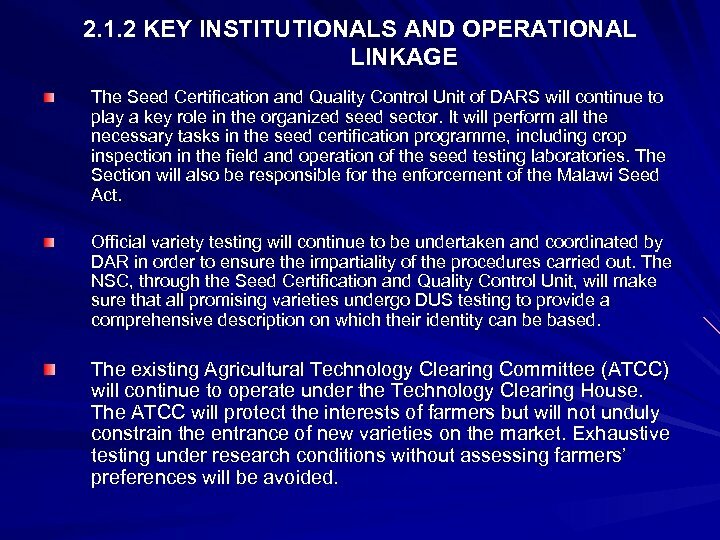 2 KEY INSTITUTIONALS AND OPERATIONAL LINKAGE The Seed Certification and Quality Control Unit of DARS will continue to play a key role in the organized sector. It will perform all the necessary tasks in the seed certification programme, including crop inspection in the field and operation of the seed testing laboratories. 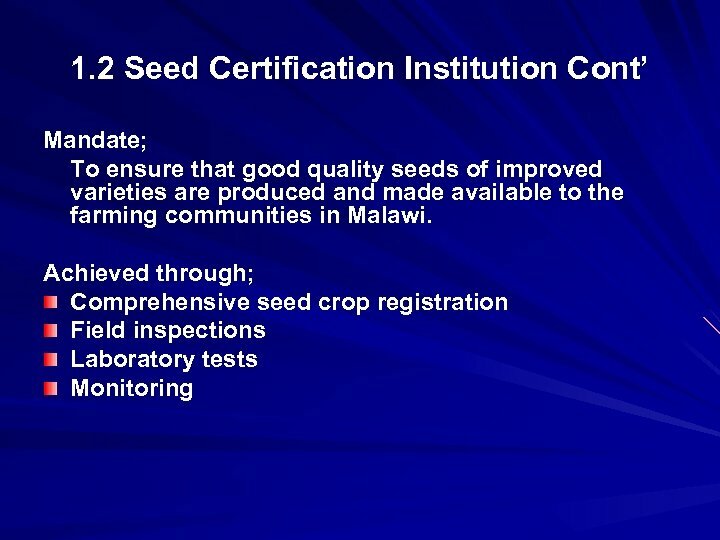 The Section will also be responsible for the enforcement of the Malawi Seed Act. Official variety testing will continue to be undertaken and coordinated by DAR in order to ensure the impartiality of the procedures carried out. The NSC, through the Seed Certification and Quality Control Unit, will make sure that all promising varieties undergo DUS testing to provide a comprehensive description on which their identity can be based. The existing Agricultural Technology Clearing Committee (ATCC) will continue to operate under the Technology Clearing House. The ATCC will protect the interests of farmers but will not unduly constrain the entrance of new varieties on the market. Exhaustive testing under research conditions without assessing farmers’ preferences will be avoided. 2. 2. 3 Breeders, Basic and Certified Seed Production The production of all breeders, basic and certified seed will be under the supervision of the Seed Certification and Quality Control Unit. In the commercial seed sector, Government is concerned to promote the development of competition for the benefit of the smallholder farmer. Any organization or individual will therefore be permitted to produce and sell seed provided such seed meets the minimum quality standards and procedures stipulated in the Seed Act and Regulations. 2. 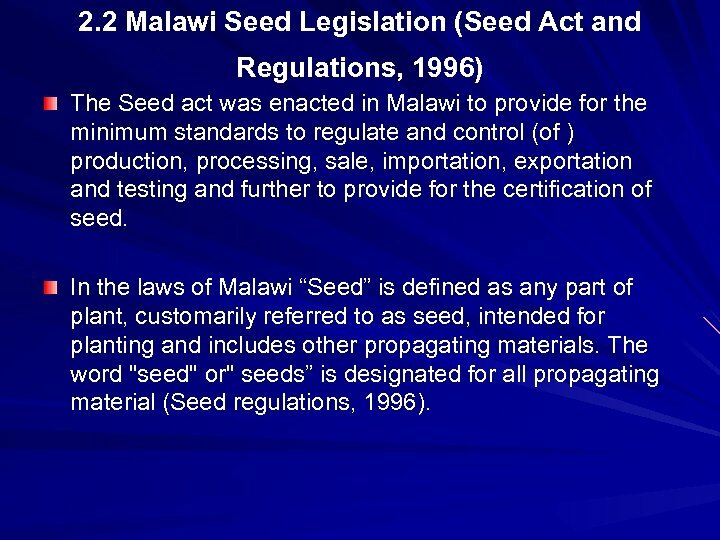 2 Malawi Seed Legislation (Seed Act and Regulations, 1996) The Seed act was enacted in Malawi to provide for the minimum standards to regulate and control (of ) production, processing, sale, importation, exportation and testing and further to provide for the certification of seed. In the laws of Malawi “Seed” is defined as any part of plant, customarily referred to as seed, intended for planting and includes other propagating materials. 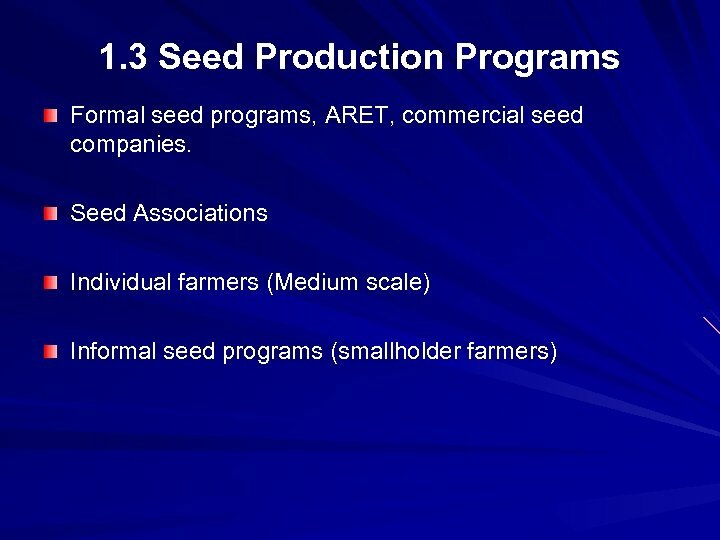 The word "seed" or" seeds” is designated for all propagating material (Seed regulations, 1996). 2. 2. 1 IMPORT AND EXPORT OF SEED The Malawi Government may allow importation of certified seed in case of unavailability of sufficient quantities. Any seed imported into Malawi should be approved seed and not restricted seed. The seed should conform to seed standards and other requirements prescribed by the importing country. If the seed is packed in a container, the container should be clearly labeled stating the genus, species, variety and the country of origin. 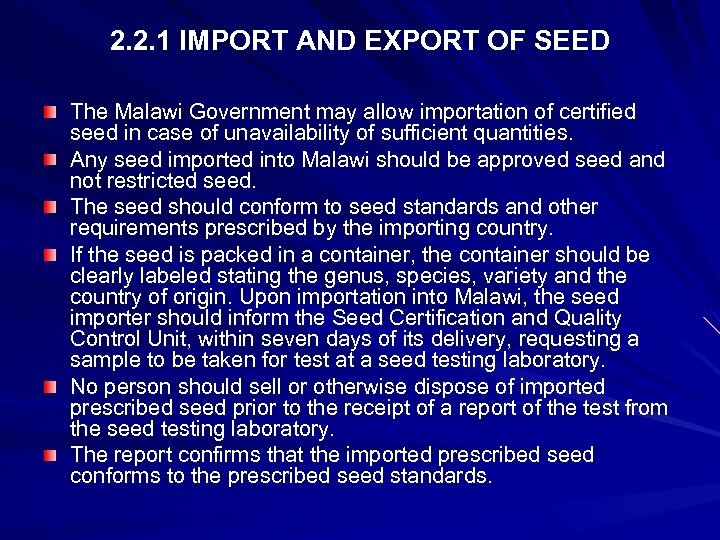 Upon importation into Malawi, the seed importer should inform the Seed Certification and Quality Control Unit, within seven days of its delivery, requesting a sample to be taken for test at a seed testing laboratory. No person should sell or otherwise dispose of imported prescribed seed prior to the receipt of a report of the test from the seed testing laboratory. The report confirms that the imported prescribed seed conforms to the prescribed seed standards. 3. 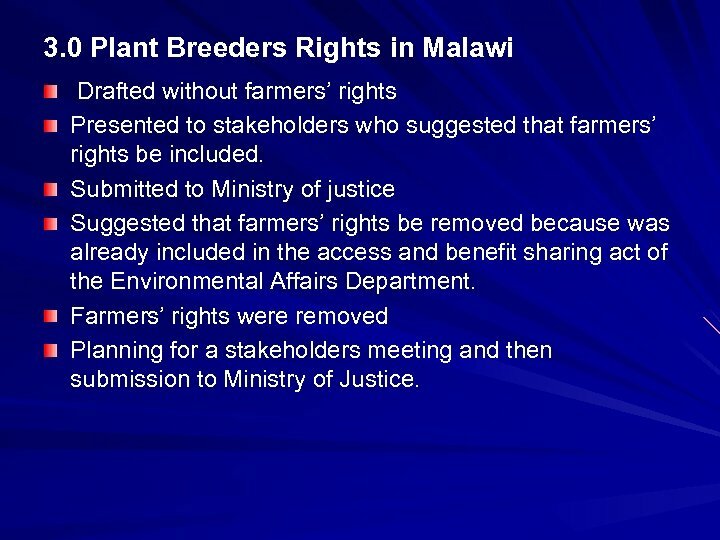 0 Plant Breeders Rights in Malawi Drafted without farmers’ rights Presented to stakeholders who suggested that farmers’ rights be included. Submitted to Ministry of justice Suggested that farmers’ rights be removed because was already included in the access and benefit sharing act of the Environmental Affairs Department. Farmers’ rights were removed Planning for a stakeholders meeting and then submission to Ministry of Justice. 4. 0 Crop Variety testing, Registration and Release process Done by breeders Done in three years on station and two years on farm in different agro ecological zones. Varieties preferred by farmers are selected Proposal is written and submitted to ATCC for release. After release, Seed Certification and Quality Control Unit verifies quality of the variety. Varieties released are documented (listed) by Secretariat of ATCC (Department of Research). 5. 0 Quarantine and Phytosanitory measures for seed 5. 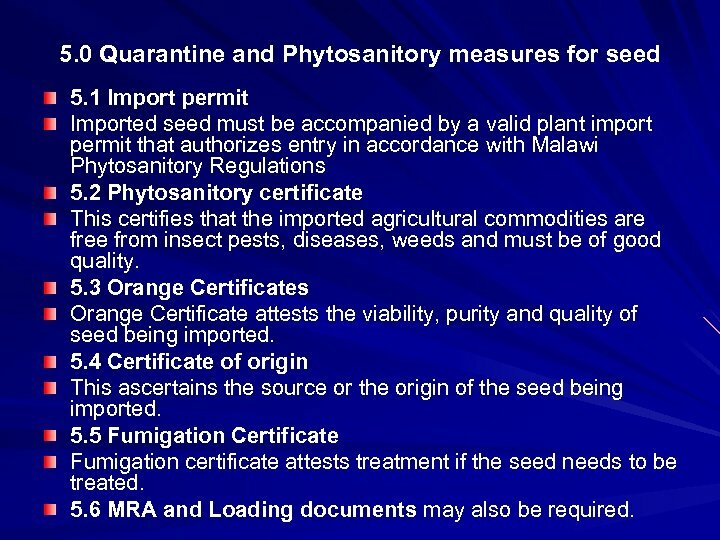 1 Import permit Imported seed must be accompanied by a valid plant import permit that authorizes entry in accordance with Malawi Phytosanitory Regulations 5. 2 Phytosanitory certificate This certifies that the imported agricultural commodities are free from insect pests, diseases, weeds and must be of good quality. 5. 3 Orange Certificates Orange Certificate attests the viability, purity and quality of seed being imported. 5. 4 Certificate of origin This ascertains the source or the origin of the seed being imported. 5. 5 Fumigation Certificate Fumigation certificate attests treatment if the seed needs to be treated. 5. 6 MRA and Loading documents may also be required. 6. 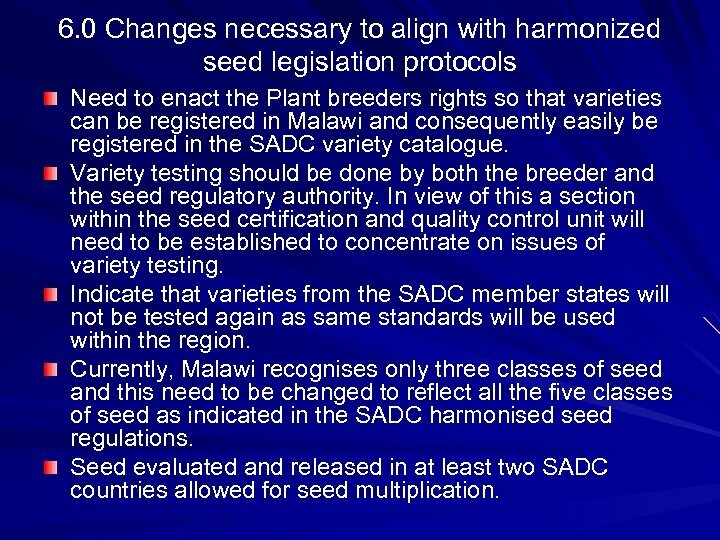 0 Changes necessary to align with harmonized seed legislation protocols Need to enact the Plant breeders rights so that varieties can be registered in Malawi and consequently easily be registered in the SADC variety catalogue. 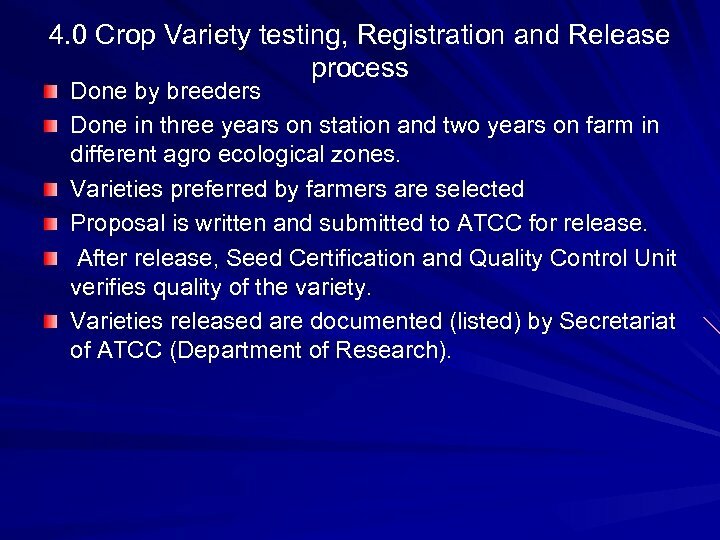 Variety testing should be done by both the breeder and the seed regulatory authority. In view of this a section within the seed certification and quality control unit will need to be established to concentrate on issues of variety testing. Indicate that varieties from the SADC member states will not be tested again as same standards will be used within the region. 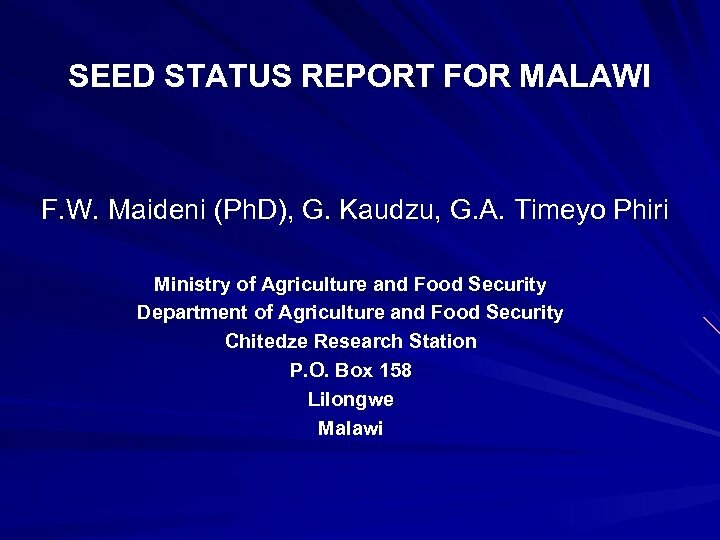 Currently, Malawi recognises only three classes of seed and this need to be changed to reflect all the five classes of seed as indicated in the SADC harmonised seed regulations. Seed evaluated and released in at least two SADC countries allowed for seed multiplication. 7. 0 Implementing Institution’s capacity and Challenges faced The institution to implement the harmonised seed regulations will be all stakeholders in the seed industry coordinated DARS (Seed services unit and Plant protection services). There will be need to develop capacity for both human resource and infrastructure to ensure that implementation is successful. 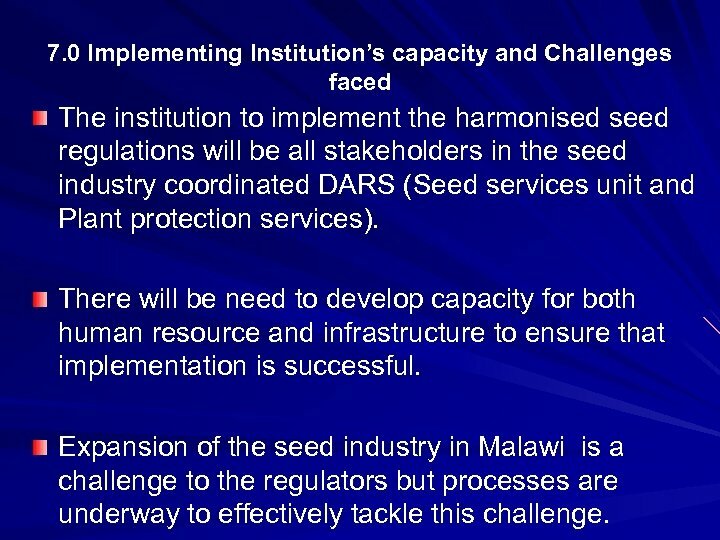 Expansion of the seed industry in Malawi is a challenge to the regulators but processes are underway to effectively tackle this challenge.